Talk all about this celebrity challenge here. 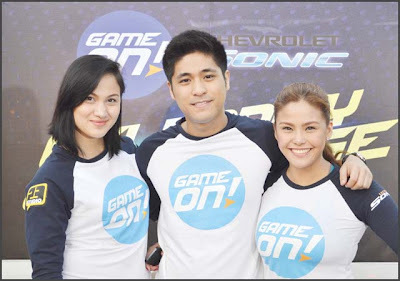 Reality stars, TV anchors, a Fil-Am actress and a student athlete put their game faces on for the latest celebrity reality show this summer, “Game On: The Chevrolet Sonic Celebrity Challenge,” to be aired on Studio 23 this April. “Fear Factor’s” Manuel Chua, host Andrei Felix, Ateneo’s volleybelle Gretchen Ho (Team Sonic White) and “Pinoy Big Brother’s” Paul Jake Castillo, news anchor Gretchen Fullido, and Star Magic’s Melissa Ricks (Team Sonic Blue) said “game on” to Chevrolet Sonic’s race that will take them to an exciting road of adventure. The contestants face several physical and mental tasks such as circuit training, a contest inspired by the game Angry Bird, buco-pie selling and a cooking challenge in Tagaytay. Apart from being an exciting game that will highlight the style, power, efficiency, handling and entertainment system of Chevrolet Sonic, the contest will also benefit a worthy cause by Covenant Car Company Inc.’s commitment to donate several unbreakable footballs to sports institution. Hosted by Boom Gonzales, the “Game On: The Chevrolet Sonic Celebrity Challenge” will air on April 6 and 13, 6 p.m. on Studio 23! Chevrolet Philippines launched recently the Chevy Sonic Game On campaign that is geared towards high spirited individuals who strive to achieve success and does not settle for anything average. They find excitement in being the dependable go-to-guy of the team. The Chevrolet Sonic man or woman is a natural born winner and achiever. Their weapon of choice is the sporty Chevrolet Sonic. The Chevrolet Sonic is an outstanding car that is ready to take on life’s challenges, achieve commendable success and rise above the rest. And what better way to communicate the “Game On” campaign, than to tie-up with the country’s premiere “kabarkada” channel, Studio 23? This April, buckle up and hold on to your seats as Studio 23 and Chevrolet Philippines brings you, “Game On! : The Chevrolet Sonic Celebrity Challenge!” Hosted by Boom Gonzales, this one-of-a-kind celebrity challenge pits two teams against one another, in a quest to be hailed the best. Team Sonic White consists of “Fear Factor” hunk Manuel Chua, The Blue Eagles Volleyball Siren, Gretchen Ho and ABS-CBN’s seasoned host Andrei Felix. “GAME ON: The Chevrolet Sonic Celebrity Challenge” airs on April 6 and 13 at 6 p.m. on Studio 23.